7. Department of Central Laboratory, Shanghai Chest Hospital, Shanghai Jiao Tong University, 241 West Huaihai Road, Shanghai 200030, China. Atrial fibrillation (AF), the most common type of cardiac rhythm disturbance encountered in clinical practice, is associated with substantially increased morbidity and mortality. Aggregating evidence demonstrates that abnormal cardiovascular development is involved in the pathogenesis of AF. A recent study has revealed that the TBX5 gene, which encodes a T-box transcription factor key to cardiovascular development, was associated with AF and atypical Holt-Oram syndrome. However, the prevalence and spectrum of TBX5 mutation in patients with lone AF remain unclear. In this study, the coding regions and splicing junction sites of TBX5 were sequenced in 192 unrelated patients with lone AF and 300 unrelated ethnically-matched healthy individuals used as controls. The causative potential of the identified TBX5 variation was evaluated by MutationTaster and PolyPhen-2. The functional effect of the mutant TBX5 was assayed by using a dual-luciferase reporter assay system. As a result, a novel heterozygous TBX5 mutation, p.H170D, was identified in a patient, with a mutational prevalence of approximately 0.52%. This mutation, which was absent in the 300 control individuals, altered the amino acid completely conserved evolutionarily across species, and was predicted to be disease-causing. Functional deciphers showed that the mutant TBX5 was associated with significantly reduced transcriptional activity when compared with its wild-type counterpart. Furthermore, the mutation significantly decreased the synergistic activation between TBX5 and NKX2-5 or GATA4. The findings expand the mutational spectrum of TBX5 linked to AF and provide new evidence that dysfunctional TBX5 may contribute to lone AF. Keywords: Atrial fibrillation, Genetics, Transcription factor, TBX5, Reporter gene assay. Atrial fibrillation (AF), the most common type of cardiac arrhythmia encountered in the setting of clinical practice, accounts for approximately one-third of hospitalizations for miscellaneous cardiac rhythm disorders . The estimated prevalence of AF is 1% in the general population, and increases with advancing age, rising from less than 1% in persons under 60 years of age to nearly 10% in people aged over 80 years . AF is responsible for substantially increased morbidity and mortality, conferring a five-fold increased risk of thromboembolic stroke and a two-fold increased risk of demise [2, 3]. Moreover, the incidence of AF-associated stroke also increases with advancing age, rising from 1.5% of subjects in their fifties to 23.5% in octogenarians [1, 3]. Additionally, AF may result in degraded quality of life, poor exercise performance, impaired cognitive function, reduced pulmonary function, tachycardia-induced cardiomyopathy, myocardial infarction, left ventricular dysfunction and congestive heart failure [1,4-7]. Therefore, the social and economic burden of AF is enormous and will continue to increase in the future , which warrants continued efforts to identify the etiologies underpinning AF. AF is frequently associated with various cardiac and systemic conditions, including coronary heart disease, rheumatic heart disease, congenital heart disease, cardiac surgery, pulmonary heart disease, dilated cardiomyopathy, myocarditis, hypertension, chronic renal disease, hyperthyroidism, metabolic disorders, obstructive sleep apnea, non-steroidal anti-inflammatory drug use, and even cancers [1,9-23]. However, in 2% to 45% of AF patients, there are no apparent pathologic substrates for AF, and such AF is referred to as lone AF [1, 24]. A growing body of evidence has convincingly demonstrated that genetic defects play a key role in the pathogenesis of lone AF, and a long list of mutations in over 30 AF-associated genes have been reported, including KCNQ1, KCNH2, KCNE1-5, KCNJ2, KCNA5, SCN5A, KCND3, GJA5, GJA1, ANP, and SCN1-4B [25-43]. Nevertheless, these established AF-associated genes seem to be uncommon causes of AF, and in an overwhelming majority of cases, the genetic determinants underling AF remain unclear. Aggregating evidence shows that cardiovascular developmental abnormality is a common important anatomic substrate for AF . Studies in developmental biology have revealed the pivotal role of several transcription factors in the normal cardiovascular development, including homeobox transcription factors NKX2-5, NKX2-6 and PITX2, zinc finger transcription factors GATA4, GATA5 and GATA6, and T-box transcription factors TBX1, TBX3, TBX5 and TBX20 [45-48], and a number of mutations in the genes NKX2-5, NKX2-6, PITX2c, GATA4, GATA5 and GATA6 have been causally linked to AF [43,49-59]. Interestingly, recent studies associated a common sequence variation in TBX5 with enhanced susceptibility to AF [60-62], and a TBX5 mutation was identified in patients with AF and atypical Holt-Oram syndrome . However, the prevalence and spectrum of TBX5 mutation in patients with lone AF is still to be evaluated. This study was conducted in conformity with the ethical principles of the revised Declaration of Helsinki (Somerset West, Republic of South Africa, 1996). The study protocol was reviewed and approved by the local institutional ethics committee, and written informed consents were obtained from all participants prior to the study. This study included a cohort of 192 unrelated patients with lone AF and a total of 300 ethnically-matched, unrelated healthy individuals used as controls. They were enrolled from the Chinese Han population. All the study subjects underwent comprehensive physical examination, routine biological test, standard 12-lead electrocardiogram and trans-thoracic echocardiogram. X-ray and coronary angiography were performed only when indicated. The clinical data including medical records, electrocardiogram and echocardiography reports were collected and reviewed. Subjects with hypertension, ischemic heart diseases, congenital heart disease, rheumatic heart disease, diabetes, metabolic diseases, or any other known risk factor of AF were excluded from the current study. The study subjects were clinically classified according to the 2014 AHA/ACC/HRS guideline for the management of patients with AF . Briefly, lone or idiopathic AF was defined as AF occurring in the absence of other cardiac or systemic diseases; familial AF, lone AF occurred in two or more first-degree relatives of a family; paroxysmal AF, AF that terminated spontaneously or with intervention within 7 days of onset; persistent AF, AF lasting more than 7 days; longstanding persistent AF, continuous AF of >12 month duration; permanent AF was used when a joint decision was made by the patient and clinician to cease further attempts to restore and/or maintain sinus rhythm. Peripheral venous blood samples were taken from the study participants and genomic DNA was extracted from white blood cells using the Wizard Genomic DNA Purification Kit (Promega, Madison, WI, USA). The referential genomic DNA sequence of TBX5 was from GenBank (GenBank ID: NG_007373.1), a gene sequence database at the National Center for Biotechnical Information (NCBI; http://www.ncbi.nlm.nih.gov/). The intronic primer pairs used to amplify the coding regions and splicing junctions of TBX5 by polymerase chain reaction (PCR) were designed as previously described [64,65]. The TBX5 gene was scanned for potential sequence variation by direct PCR-sequencing in 192 unrelated patients with lone AF and 300 unrelated control individuals. PCR was carried out using HotStar Taq DNA Polymerase (Qiagen, Hilden, Germany) on a Veriti Thermal Cycler (Applied Biosystems, Foster, CA, USA) with standard conditions and concentrations of reagents. The amplified products were purified with the QIAquick Gel Extraction Kit (Qiagen, Hilden, Germany). The amplicons were sequenced under an ABI PRISM 3130 XL DNA Analyzer (Applied Biosystems, Foster, CA, USA) with BigDye® Terminator v3.1 Cycle Sequencing Kits (Applied Biosystems, Foster, CA, USA). The sequencing primers were the same as those used for exonic amplifications. DNA sequences were analyzed with the DNA Sequencing Analysis Software v5.1 (Applied Biosystems, Foster, CA, USA). A sequence variance was verified by bi-directional re-sequencing of an independent PCR-generated amplicon from the same subject. For an identified sequence variance, several databases including the Human Gene Mutation Database (HGMD; http://www.hgmd.cf.ac.uk/), the NCBI′s Single Nucleotide Polymorphism (SNP; http://www.ncbi.nlm.nih.gov/snp) database and PubMed Database (http://www.ncbi.nlm.nih.gov/pubmed) were queried to confirm its novelty. To evaluate whether an altered amino acid was evolutionarily conserved, the amino acid sequences of TBX5 in human were aligned with those in chimpanzee, monkey, dog, cattle, mouse, rat, fowl, zebrafish and frog by using the HomoloGene and Show Multiple Alignment links on the NCBI's web site (http://www.ncbi.nlm.nih.gov/homologene). The disease-causing potential of a TBX5 sequence variation was predicted by the online programs of MutationTaster (http://www.mutationtaster.org) and PolyPhen-2 (http://genetics.bwh.harvard.edu/pph2), automatically giving a probability score for each alteration to be either pathogenic or benign. The recombinant expression plasmid TBX5-pcDNA3.1, which contains the full-length cDNA of human TBX5, was constructed as described previously [64,65]. The mutant TBX5-pcDNA3.1 was generated by PCR-mediated site-directed mutagenesis using a complimentary pair of primers and QuickChange II XL Site-Directed Mutagenesis Kit (Stratagene, La Jolla, CA, USA), and was validated by sequencing. The recombinant expression plasmids NKX2-5-pEFSA and GATA4-pSSRa, and the atrial natriuretic factor (ANF)-luciferase reporter plasmid, which contains the 2600-bp 5'-flanking region of the ANF gene and expresses the Firefly luciferase, namely ANF-luc, were generous gifts from Dr. Ichiro Shiojima, at the Department of Cardiovascular Science and Medicine, Chiba University Graduate School of Medicine, Chiba, Japan. COS-7 cells were maintained in Dulbecco's modified Eagle's medium supplemented with 10% fetal bovine serum and 1% Penicillin/Streptomycin, in an atmosphere with 5% CO2 at 37°C. Transient tranfections were performed in triplicate using the Lipofectamine® 2000 transfecting reagent (Invitrogen, Carlsbad, CA, USA), following the manufacturer's instructions. To normalize transfection efficiency, the internal control vector pGL4.75 (hRluc/CMV, Promega) expressing the Renilla luciferase was used in transfection assays. COS-7 cells at about 90% confluence were transiently transfected with 0.5 μg of wild-type TBX5-pcDNA3.1, NKX2-5-pEFSA, GATA4-pSSRa, or mutant TBX5-pcDNA3.1, alone or together, in combination with 1.0 μg of ANF-luc and 0.04 μg of pGL4.75. Cells were harvested and lysed 48 h after transfection, and the Firefly luciferase and Renilla luciferase activities were measured with the lysates and the Dual-Glo luciferase assay system (Promega, Madison, WI, USA). The activity of the ANF promoter was presented as fold activation of Firefly luciferase relative to Renilla luciferase. The SPSS version 17.0 software package (SPSS Inc, Chicago, IL, USA) was used to make statistical analyses. Data are expressed as means ± SD, unless otherwise indicated. Continuous variables were tested for normal distribution and Student's unpaired t test was used for the comparison of numeric variables between two groups. Comparison of the categorical variables between two groups was made using Pearson's χ2 test or Fisher's exact test when appropriate. A two-tailed p value < 0.05 indicated significant differences. In this study, 192 unrelated patients with lone AF was clinically evaluated in comparison with 300 ethnically-matched, unrelated healthy individuals. None of them had known traditional risk factors for AF. There were no significant differences between patient and control groups in baseline characteristics including age, gender, ethnicity, body mass index, blood pressure, serum lipid, fasting blood glucose, left atrial dimension and left ventricular ejection fraction. The baseline clinical characteristics of the 192 patients with lone AF are summarized in Table 1. Baseline clinical characteristics of the 192 patients with lone atrial fibrillation. Data are expressed as means and standard deviations, number, or percentage. By DNA sequencing, a heterozygous mutation in TBX5 was identified in one of 192 unrelated patients with lone AF, with a mutational prevalence of approximately 0.52%. Specifically, a substitution of guanine (G) for cytosine (C) in the first nucleotide of codon 170 (c.508C>G), predicting the transversion of histidine (H) into aspartic acid (D) at amino acid position 170 (p.H170D), was detected in a male patient with negative family history. The mutation carrier had no apparent congenital abnormalities in the heart, hands and forearms, and his representative electrocardiogram showing AF was shown in Figure 1. The sequence chromatograms showing the heterozygous TBX5 mutation of c.508C>G and its control sequence are shown in Figure 2A. A schematic diagram of TBX5 showing the structural domains and the location of the detected mutation is illustrated in Figure 2B. The identified TBX5 mutation c.508C>G was absent in the 300 control individuals, and was not found in the HGMD, SNP and PubMed databases (accessed again on July 16, 2015), indicating that it is a novel mutation. As shown in Figure 3, alignment of multiple TBX5 proteins across species displayed that the altered histidine at amino acid position 170 was completely conserved evolutionarily, indicating its functional importance. Standard 12-lead surface electrocardiogram recorded from the mutation carrier. The representative electrocardiogram shows atrial fibrillation as well as complete right bundle branch block. Novel TBX5 mutation associated with atrial fibrillation. (A) Sequence electropherograms showing the TBX5 mutation in contrast to its wild type. The arrow indicates the heterozygous nucleotides of C/G in the mutation carrier (mutant) or the homozygous nucleotides of C/C in the corresponding control individual (wild type). The rectangle marks the nucleotides constituting a codon of TBX5. (B) Schematic diagram of TBX5 protein structures with the identified mutation marked. The mutation identified in a patient with lone atrial fibrillation is shown above the structural domains. NH2 denotes amino-terminus, and COOH, carboxyl-terminus. Alignment of multiple TBX5 protein sequences across various species. The altered histidine at amino acid 170 is completely conserved evolutionarily among various species. The TBX5 mutation was predicted to be disease-causing by MutationTaster, with a p value of approximately 1.000, and this amino acid substitution was also predicted to be possibly damaging by PolyPhen-2, with a score of 0.993 (sensitivity: 0.47; specificity: 0.96), suggesting that mutated TBX5 might contribute to the development of AF in a subset of patients. No SNPs in the altered region were reported in the MutationTaster database. As shown in Figure 4, biological assays revealed that the same amount of wild-type and H170D-mutant TBX5 activated the ANF promoter by ∼10-fold and ∼3-fold, respectively (wild type vs mutant: t = 7.95435, P = 0.00135), indicating that the H170D-mutant TBX5 has a significantly decreased transcriptional activity compared with its wild-type counterpart. As shown in Figure 4, TBX5 in combination with NKX2-5 or GATA4 activated the ANF promoter in a synergistic manner. In the presence of wild-type NKX2-5, the same amount of wild-type and H170D-mutant TBX5 induced activation of the ANF promoter by ∼35-fold and ∼13-fold, respectively (wild type vs mutant: t = 12.2622, P = 0.00025); while in the presence of wild-type GATA4, the same amount of wild-type and H170D-mutant TBX5 induced activation of the ANF promoter by ∼23-fold and ∼8-fold, respectively (wild type vs mutant: t = 9.81299, P = 0.00060). These results suggest that the TBX5 mutation is associated with significantly reduced transactivational activity in synergy with NKX2-5 or GATA4. 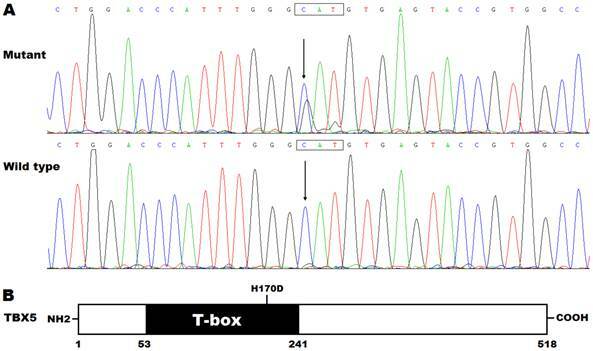 In the present study, a novel heterozygous TBX5 mutation, p.H170D, was identified in a patient with lone AF. The missense mutation, which was absent in the 600 reference chromosomes, altered the amino acid that was completely conserved evolutionarily across species, and was predicted to be pathogenic by both MutationTaster and PolyPhen-2. Functional deciphers revealed that H170D-mutant TBX5 was associated with a significantly diminished transcriptional activity alone or in synergy with NKX2-5 or GATA4. Therefore, it is probable that the identified TBX5 mutation predisposes the carrier to AF. The T-box genes encode a family of transcription factors that are characterized by a highly conserved DNA-binding region called T-box. This T-box recognizes and binds specific DNA elements in the promoters of target genes such as ANF and CX40, regulating transcriptional activation or repression. Moreover, the T-box is also a conserved interaction domain for other transcriptionally cooperative partners including NKX2-5 and GATA4 . To date, in the mammalian heart, at least 6 members (TBX1, TBX2, TBX3, TBX5, TBX18 and TBX20) of the T-box gene family have been identified as crucial mediators of myocardial proliferation and patterning . As an important member of the T-box gene family, TBX5 is mapped on human chromosome 12q24.1, coding for a protein with 518 amino acids, which regulates a wide variety of developmental processes in vertebrates and invertebrates, including specification of the mesoderm and development of the heart, vasculature and limbs [48,66]. In the current study, the TBX5 mutation identified in an AF patient is located in the T-box and functional assays unveiled that the mutant protein was associated with substantially reduced transactivation of a target gene, ANF, alone or in combination with NKX2-5 or GATA4. These results suggest that TBX5 haploinsufficiency is likely an alternative pathological mechanism of AF in a minority of patients. The findings that TBX5 loss-of-function mutation contributes to AF may be attributable at least in part to the abnormal development of the heart. In humans and vertebrates, TBX5 is abundantly expressed in the heart during embryogenesis, playing a pivotal role in cardiovascular development, including myocardial cell proliferation, specification, differentiation, migration, tissue patterning and morphogenesis [48,66-69]. In mice, Tbx5 is widely expressed in cardiac crescent, linear heart tube, common atrium, ventricles, inferior and superior vena cavae, and conduction system, including atrioventricular node and ventricular bundle branches [48,66]. Homozygous disruption of Tbx5 in mice caused embryonic death due to failure of cardiac looping, hypoplasia of sinuatria and left ventricle; while analyses of heterozygous Tbx5-knockout mice demonstrated atrial septal defects, ventricular septal defects, endocardial cushion defects, left heart hypoplasia, and morphological and functional abnormalities in the conduction system, including atrioventricular and bundle branch conduction blocks [69-71]. In embryonic and adult hearts of humans, TBX5 is expressed in the epicardium, myocardium of all four cardiac chambers and endocardium of left ventricle , and a number of heterozygous or homozygous TBX5-deficient mutations have been involved in Holt-Oram syndrome, including congenital cardiovascular malformations and cardiac conduction system defects . Furthermore, in humans multiple longitudinal studies have shown that anomalous cardiac conduction system is an independent risk factor for AF . Collectively, these results support that genetically defective TBX5 confers an enhanced susceptibility to AF in humans. Functional impairments resulted from TBX5 mutation. Activation of atrial natriuretic factor promoter driven luciferase reporter in COS-7 cells by wild-type TBX5 or H170D-mutant TBX5 showed significantly decreased transcriptional activity by the mutant protein. In the presence of NKX2-5 or GATA4, the induced synergistic activation by H170D-mutant TBX5 was significantly reduced compared with that by wild-type TBX5. Experiments were performed in triplicate, and mean and standard deviations are given. * represents p < 0.005 when compared with its wild-type counterpart. It has been validated that TBX5 transactivates multiple downstream genes, such as ANF and CX40, alone or in synergy with transcriptionally cooperative partners, including NKX2-5 and GATA4 [48,64,73-75], and loss-of-function mutations in some target genes and cooperative partners, including ANF, CX40, NKX2-5 and GATA4, have been associated with AF . Therefore, functionally compromised TBX5 may increase vulnerability to AF by reducing the expressions of some target genes. It was interesting that both loss-of-function and gain-of-function mutations in TBX5 have been reported to be responsible for Holt-Oram syndrome, with AF being an uncommon clinical manifestation [72,73,76]. Additionally, previous studies have demonstrated that cellular biological sequelae of decreased and increased TBX5 expressions are similar [72,76]. Taken together, these prior findings plus the current data indicate that TBX5 dosage must be finely controlled to avoid cardiovascular diseases . In conclusion, the present study firstly associates TBX5 loss-of-function mutation with lone AF, which expands the mutational spectrum of TBX5 linked to AF and suggests the potential clinical implications for individually tailored treatment of this common arrhythmia. We are really thankful to the participants for their dedication to the study. This work was supported in part by grants from the National Natural Science Fund of China (81470372, 81400244, 81370301 and 81270161), the Natural Science Fund of Shanghai, China (13ZR1438400, 14ZR1438000 and 15ZR1438100), the Key Program for Basic Research of Shanghai, China (14JC1405500), the Experimental animal project of Shanghai, China (14140903600 and 12140902800), and the key project of Shanghai Chest Hospital, China (2014YZDH10102 and 2014YZDH20500). Corresponding authors: Zhan-Cheng Wang, Department of Cardiology, Shanghai Eighth People's Hospital, 8 Caobao Road, Shanghai 200235, China. Tel: +86-21-34284588, fax: +86-21-64514326, E-mail: wang_zhanchengcom; Yi-Qing Yang, Department of Cardiovascular Research Laboratory, Shanghai Chest Hospital, Shanghai Jiao Tong University, 241 West Huaihai Road, Shanghai 200030, China. Tel: +86-21-62821990, fax: +86-21-62821105, E-mail: yang99yang66com.